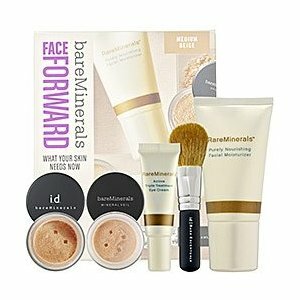 Bare Escentuals Face Forward is a collection of RareMinerals and bareMinerals, with these combined they help your skin adapt to the current season, says Bare Escentuals. The collection is also devised to nourish, invigorate, and promote cell turnover in the skin to help create a fresher, brighter and renewed complexion. As always with Bare Escentuals all the ingredients are natural and all the products contain sun protection. RareMinerals facial moisturizer 1 fl oz – helps restore moisture in the skin. RareMinerals eye cream 0.17 fl oz – rejuvenates the eye area. BareMinerals Original SPF 15 foundation 0.03 oz – covers imperfections. BareMinerals Original SPF 25 mineral veil 0.05 oz – provides the face with a soft luminosity. Basically Bare Escentuals fanatics don't have a bad word to say about the Face Forward collection. They admire the great coverage from the foundation and the lightweight, non greasy feeling of the other products. One patron says it is the only product that actually works for her sensitive acne prone skin. It is tremendous collection that is reasonably priced at $30. 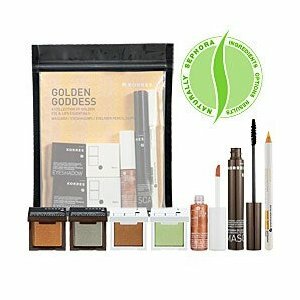 The Golden Goddess Collection is Korres best selling color products. All the products in the collection are natural and don't contain Parabens- Sulfates- Synthetic Fragrances- Petro-Chemicals- Phthalates- GMO or Triclosan. Korres put these shades together so a goddess like look could be created. It says the colors blend well together, so a natural smokey eye look can be devised. What comes in the collection? Personally I think this is a really nice set of colors, could be very appealing for those of you that like the more natural look and ingredients. The color combination went down very well with most patrons, as they said they work well together to create a pretty natural look. However, some of the users found the colors didn't work for their skin tone (usually very light skin ). One lady even said the eye shadows made her eyes itch. On the whole most people relished this collection and they think it is good value at $39.50 for the set. You are currently browsing the archives for the Makeup Kits category.